The future of the Internet hangs in the balance due to an ongoing battle between telecoms giants and the technology industry - and each side is taking a very different approach to telling their story. 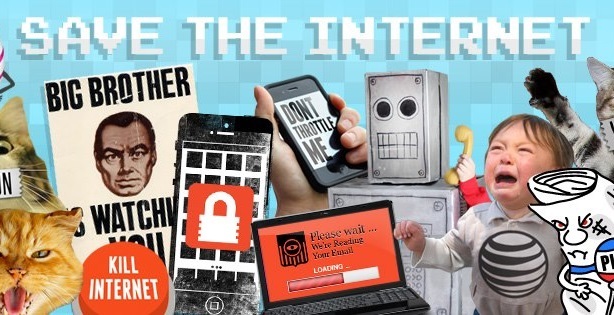 Free Press launched a dedicated site, SavetheInternet.com, to promote its cause. The debate around Web neutrality – the principle that broadband providers should treat all Web traffic equally – has been rumbling on for several years in the US. But controversial proposals put out to public comment on May 15 by the Federal Communications Commission (FCC) could result in significant changes to the Internet before the end of the year. As data-heavy content consumption increases broadband providers believe that, in order to prevent a slowing of Internet speed, companies that demand high bandwidth to deliver their services, such as Netflix, should pay more to give their users access to a faster service. In the US, Netflix and YouTube streaming represented more than 50% of all download traffic on North American fixed broadband services in the second half of 2013, according to networking tech company Sandvine. But tech companies and activists are concerned this will create a two-tiered Internet, leaving smaller companies and start-ups in the slow lane, stifling innovation and, ultimately, leaving consumers with less choice. The debate reignited in January, when a federal court struck down the FCC's 2010 Internet Order, which prohibits broadband providers from indiscriminately blocking or slowing down Web service. Prior to the vote, 150 Web companies, including Google, Facebook, Amazon, Twitter, Yahoo, and Netflix, as well as smaller companies, co-signed a letter to the FCC in May, expressing their support for an open and free Internet as an engine of entrepreneurship and economic growth - and a platform for free speech. The letter called on the FCC to protect companies from paid prioritization, discrimination, and blocking, and to make the market for Internet services more transparent. Some net neutrality campaigners have been pushing for the FCC to reclassify broadband providers, such as Verizon and Comcast, as "common carriers" under Title II of the Communications Act. This would mean broadband being treated as a utility, like phone networks, rather than a premium service. In May, Mozilla Firefox called on the FCC to use this "nuclear option." Also in the week of the vote, FCC chairman Tom Wheeler made clear his commitment to an "open, fast, and robust" Internet. "There is one Internet. Not a fast Internet, not a slow Internet; one Internet," he said in a statement. In the lead-up to the vote, the FCC heard from more than 100,000 Americans on the issue. Prior to the vote, Wheeler reportedly met net neutrality supporters campaigning outside the FCC offices who are concerned the rules put to public comment do not rule out the possibly of pay-for-priority fast lanes. In the past decade, telecoms companies have risen to become some of the biggest spenders in Washington, DC, according to OpenSecrets.org. The site shows Verizon, Comcast, and AT&T have mentioned "net neutrality" the most times in their lobbying, at 247, 228, and 212 mentions respectively during the past six years. Google, which has boosted its lobbying clout in recent years, mentioned the term 37 times, followed by Microsoft, 34, and eBay, 26. In terms of lobbying budgets, the ISPs outweigh the tech companies. For example, Netflix's lobbying expenditure in 2013 was $1.2 million, compared to Verizon’s $13.7 million. "Telecoms companies are among the strongest lobbyists in Washington, but tech companies have been ramping up spending," says Dan Auble, senior researcher at the Centre for Responsive Politics, which operates the OpenSecrets site. "The telecoms business has changed so much – cable companies provide Internet, phone, and content, so they may be competing with people on the other side of the issue." Verizon would not comment directly on its lobbying around net neutrality, but did explain that its communications focus has been on educating policymakers and consumers about its role in the "innovation ecosystem." "This has been an ongoing educational effort going back almost a decade and our focus has been on trying to help policymakers and consumers understand the importance of broadband networks, the investment Verizon has made in fibre networks, and the role we play in the ecosystem," says Ed McFadden, executive director, external communications at Verizon. In Verizon's communications, it claims to support the open Internet and wants to offer its customers the choice to "go where you want, when you want." In a public filing to the FCC, Verizon wrote that any prescriptive rules would become quickly outdated in the face of rapid technological development and change in the marketplace, standing as a barrier to new business models that could increase competition and be of service to the consumer. Comcast, Time Warner Cable, and AT&T all declined to comment on their communications strategies. Smaller Web companies and activists are also engaging the public for support, taking a grassroots approach that effectively harnesses the power of the Web to "save the Internet." Reddit, the news and social networking site, has been working with its very active community to help get the message out, prompting petitions to reach Congress and the FCC. "People in our community care a lot about this and have created some really good graphics and videos as a way of explaining it, which are being shared and recommended among co-workers, family, and friends," says Erik Martin general manager of Reddit. In May, Reddit cofounder Alexis Ohanian also rolled out a crowd-funded poster campaign across bus stops in Washington, DC, to inform the public about the issue, comparing it to the subway system, as well as letting them know how they can join the cause. "It has built momentum and that discussion between people in our community has helped overcome cynicism and a fear of calling Congress if they have never done it before," explains Martin. "That kind of thing has real impact and has been the spark that lights that fire." "We are still a pretty small company," he adds, "and this [two-tier Internet] could make it harder for us and even more difficult for the next generation of start-ups." Free Press is one of the main activist groups involved in the net neutrality campaign and has been operating both in Washington, DC, and also at grassroots level. "We want to make clear to people that what happens in Washington matters," says Matt Wood, policy director at Free Press. "But that’s not the reason we are doing it. It is important for people to have freedom of expression and services that let them go where they want online." Free Press has launched a dedicated site, SavetheInternet.com, with information on how the public can get involved with the campaign, such as ways to contact Congress and the FCC. It has been using the #savetheinternet hash tag on Twitter, and was among the campaigners outside the FCC's offices in May. "The Internet is the communications system of our time – of course we want it to be free from corporate and government interference," adds Wood. "We need some protection for users, both for the companies that make their business on it and also for all the millions who rely on having access." The larger Internet companies have not done much public messaging on the issue, as previously, says Wood. But while the collective lobbying budget of the Free Press and other campaigning groups does not come close to that of the larger ISPs, he believes leveraging the power of millions of people who individually have no shot against the giant corporations will be effective. "There is no contest when it comes to money and lobbying power," he explains, "but we have more people and more time-tested ideas. So we are competing on a level playing field."